Partly cloudy skies this morning. Thunderstorms likely during the afternoon. High 69F. Winds SW at 5 to 10 mph. Chance of rain 80%.. Rain likely. Low 44F. Winds N at 5 to 10 mph. Chance of rain 90%. Rainfall near a half an inch. Al Henderson looks at the Lewis peace-pipe tomahawk replica at his desk outside the Senate Chambers. The original peace-pipe tomahawk is at the Western Spirit Scottsdale’s Museum of the West in Scottsdale, Arizona. The replica, with a letter from Governor Brad Little, was made by Joe De La Ronde of De La Ronde Forge in Colorado. It cost $961.77 to make. BOISE -- Some sessions of the Idaho State Legislature run longer than others. 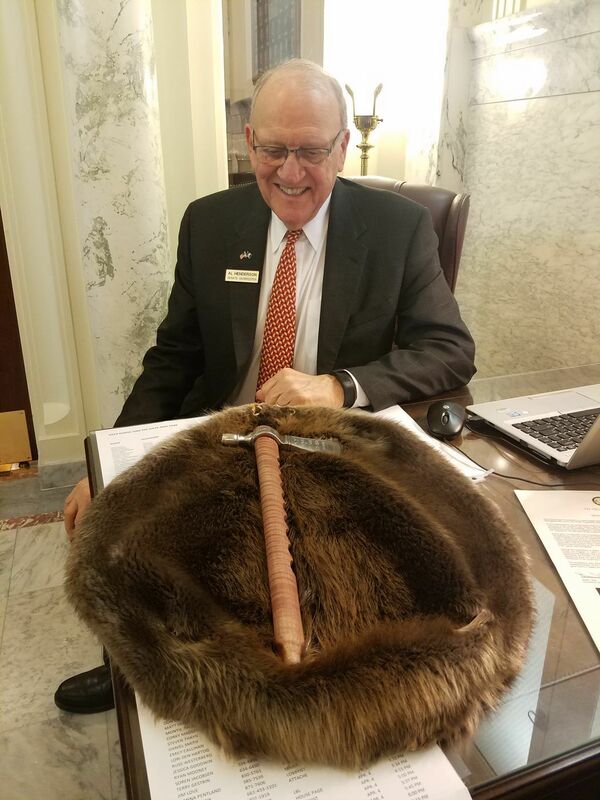 Over the years, employees at the Idaho State Capitol have been making their best guess at the end date for a chance to win the “Sine Die Prize”. The “Sine Die Prize” has been tradition for nine years. Since then, every legislative session all legislators and state employees who work in the Capitol can enter a poll by a specific deadline with their guess of the exact date and time when the session will adjourn, or sine die. The person with the closest date and time wins. “It’s just something fun to do,” Al Henderson said in an interview. Henderson, the Senate Chambers doorkeeper, started the sine die competition when he decided to give away a book from the Capitol gift shop that contained signatures from all the Capitol building workers that he collected. Each year after, the prizes have become more elaborate and this year’s prize is the most extravagant one yet. The 2019 sine die prize is a hand-forged replica of Meriwether Lewis’ peace-pipe tomahawk that he carried during the Lewis & Clark Expedition from 1804-1806. “We really like doing something that’s attached to Idaho’s history and this was kind of a natural,” Henderson said. 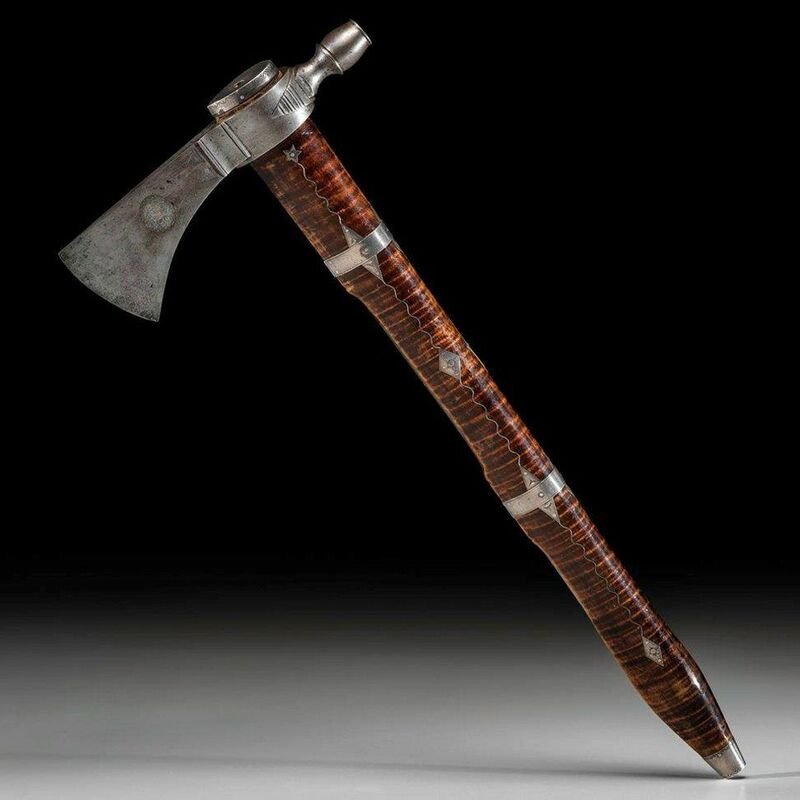 According to family tradition, President Thomas Jefferson gifted the tomahawk to Lewis before the expedition, to represent himself and the United States of America. On August 13, 1805, Lewis described in his journal the day he met Chief Cameahwait, brother of Sacajawea, of the Lemhi Shoshone. Lewis shared his peace pipe with the chief and gave him an American flag “to be respected as a bond of union between us,” Lewis wrote in his journal. There is one noticeable detail between the two tomahawks. The original tomahawk’s design contains silver in the handle with “ML” stamped on the blade’s face. The replica, however, doesn’t have silver in the handle, but engraved on the same place of the blade is “LEWIS & CLARK 1805-1806 IDAHO”. Henderson says each prize has a connection to Idaho’s history. Last year, a Bowie knife made in Post Falls, Idaho at Buck Knives was given away. The handle was made from a piece of the Rock Sugar Maple tree planted in 1903 to commemorate President Theodore Roosevelt’s visit to Idaho. Henderson doesn’t have an idea for next year’s prize, but he knows this year’s will be hard to beat. “That’s a problem that we’re about to be faced with, how do we top this,” Henderson said. By Monday, April 8, there will only be 13 people still in the running to win. Henderson expects the session to continue for another week or two. Cheyenna McCurry is a legislative intern with the James A. and Louise McClure Center for Public Policy Research in Boise, and a student in the University of Idaho School of Journalism and Mass Media.